Microcytic anemia Defined as the presence of small, often hypochromic, red blood cells in a peripheral blood smear and is usually characterized by a low mean cell volume (MCV) (<83 micron3). Iron deficiency is the most common cause of microcytic anemia. Mactocytic anaemia (Macrocytosis): defined as a mean corpuscular volume greater than 100 fL, is frequently encountered when a complete blood count is performed. The most common etiologies are alcoholism, vitamin B12 and folate deficiencies, and medications. Vitamin B12 is found in meat, fish, and dairy products. NOT in plants. The liver can store Vitamin B12 and stores are sufficient for up to 5 years. The daily requirement of vitamin B12 is about 2.4 μg. Side note Vitamin B12 is found almost exclusively in animal-based foods and is therefore a nutrient of potential concern for those following a vegetarian or vegan diet. Vegans, and anyone who significantly limits intake of animal-based foods, require vitamin B12-fortified foods or supplements. Remember Vitamin B12 (cobalamin) is a water-soluble vitamin that is crucial to normal neurologic function, red blood cell production, and DNA synthesis. Remember Peripheral neuropathy is the most common symptom of vitamin B12 deficiency. Folate deficiency alone typically has no neurological symptoms. Vitamin B12 deficiency paresthesias related to peripheral neuropathy, poor or strict vegan diet, lack of socioeconomic resources, bowel-related symptoms (including diarrhea), or a history of bowel surgery for weight loss. Findings on physical examination may include neurologic signs such as ataxia, decreased proprioception, and vibratory sensation. Patients may also have poor dentition or nonspecific oral stomatitis or glossitis. Serum Vitamin B12. Folate deficiency Serum folate levels are not useful. RBC folate levels is more accurate. Side note In differentiating the cause of megaloblastic anemia, a methylmalonic acid level that is within normal range also points toward a diagnosis of folate deficiency, especially if the serum vitamin B12 level is within the normal range. Note that homocysteine levels will be elevated with vitamin B12and folate deficiencies. Both the clinical recognition of vitamin B12 deficiency and confirmation of the diagnosis by means of testing can be difficult. Methylmalonic acid – more sensitive and specific for the diagnosis. Think Serum vitamin B12 levels can be normal even in vitamin B12 deficiency. This is because during periods of stress, the body will produce more transcobalamin (carrier protein for VB12). Measuring methylmalonic acid is thus more sensitive. Overview Pernicious Anaemia is a condition where there is lack of intrisinc factor, a glycoprotein responsible for the absorption of Vitamin B12. Vitamin B12 (Cobalamin) is an essential vitamin responsible for many physiological process in our body. Vitamin B12 deficiency causes megaloblastic anaemia and maybe accompanied by neurological abnormalities. 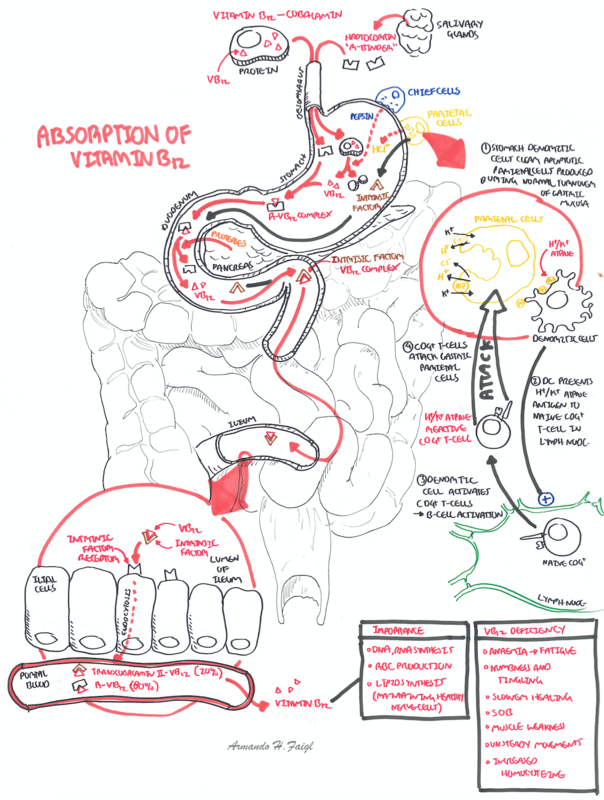 Autoimmune metaplastic atrophic gastritis (AMAG): AMAG is an inherited autoimmune disease that attacks parietal cells. The immune system targets the Na+/K+ ATPase pump on parietal cells resulting in cell apoptosis. Parietal cells are responsible for secreting acid for digestion and intrinsic factor (IF) for Vitamin B12 absorption. AMAG leads to pernicious anaemia. Autoantibody formation against intrinsic factor receptors: Autoantibodies can target IF receptors on Ileal cells preventing IF binding to IF receptors. 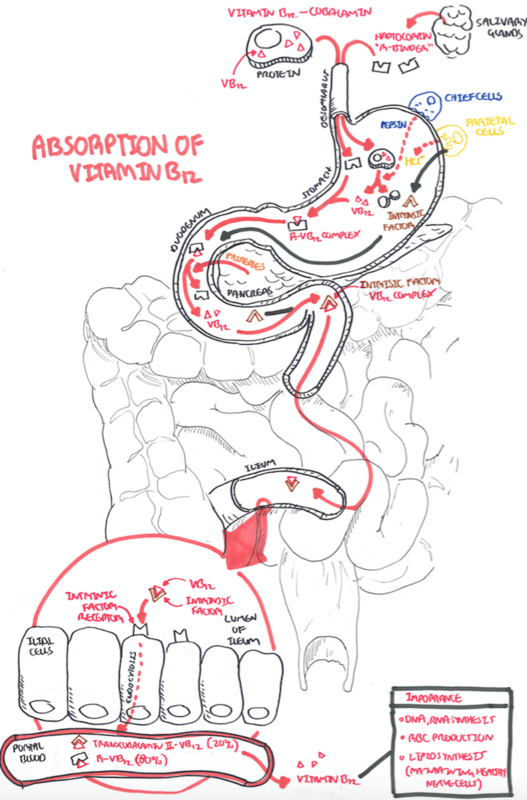 Symptomatic Treatment For patients with pernicious anaemia or malabsorption, lifelong vitamin B12 therapy is indicated. Early diagnosis and treatment is important to prevent severe neurological and haematological deficits. Patients usually do well with treatment. Langan, RC., Zawistoski, KJ. (2011). Update on Vitamine B12 Deficiency. American Family Physician. 83 (12). 1425-1430. Stabler, SP. (2013). Vitamin B12 Deficiency. New England Journal Of Medicine. 368. 149-160.